Flutewise Croatia 2018 — Flutewise Live! I've just come back from another really wonderful course in Croatia. This year we had 10 British flute players who came along with parents, grandparents, aunts, uncles and cousins. With the Croatian flute players and friends added in there were more people this year than ever! It was so much fun and a totally magical experience for everyone to perform in the beautiful Kastel Vitturi. We started the course on the Wednesday morning and we were due to have classes for the rest of the week, go to the island of Brac on Sunday, have 2 more days of classes and then have the final concert on Tuesday evening. Often things don't go to plan in Croatia ... which is fine! This time it was the weather forecast for the Sunday. Really big storms were promised. So we decided to change plans and got to Brac on Friday. This meant a change in plan over what we would perform for a concert there. I've been doing a course in this part of Croatia for 15 years (I've been doing courses in Croatia for even longer than that, which makes me feel very old!). My friend Najda, who was one of the key people who started the course in Kastela for local children, came along with her grandson, Luka! It seemed like only last year Luka's mum and uncle were involved as children. Luka was our only beginner this year and everyone enjoyed and loved him. He did so well and having him there was a great excuse for teenagers to get involved with songs and clapping games. We all just loved coming up with new rhymes for "There's a spider on ..."
We worked quite hard each day and achieved a great deal. On the first evening of the course we had a Flutewise pizza party and concert for all the British people. This was an opportunity for everyone to meet and get to know each other and for the flute players to perform in an informal setting if they wanted to. It was lovely. On Friday morning we left for Brac, travelling by taxi, ferry then coach. We explored the park and said hello to all of the animals, the parrots and mad ostrich being very popular. Our lunch followed and then we rehearsed our concert in the amphitheatre which we were really impressed with the improvement since last year. It was hot. Very hot! One of the locals told me it was 55 degrees in the sun! We waited until it was cooler before our concert which consisted of Max, Sophie and Tomoko playing some trios, Cecilia and Thea playing a duet and everyone playing three pieces with backing tracks. I had recently bought myself a Ultimate Ears Megaboom blue tooth speaker. It was intended for listening to music indoors, but I thought I'd give it a try outdoors as we hadn't much time to prepare the concert. It was amazing! It totally filled the outdoor amphitheatre with sound. It's a tradition in Croatia for us always to finish any concert with Ian Clarke's Walk Like This. Everyone loves it. The next day we had off so British families had the opportunity to do a full day of sight seeing. It was back to work in the Ballet School on Sunday. Time went quickly and what seemed like no time at all we were in Kastel Vitturi. It is a truly magical place to perform a concert. We were very lucky to have the wonderful flute player Marko Zupan there at the same time as us and he joined us for our concert. Another Marko, the brother of one of our course members also joined us as a guest to play a solo on his recorder. He is a Grade 8 player and he plays very well. We had a great audience who seems to really appreciate our work. Certificates and medals were given out at the end and then we all went back to the terrace at Villa Soulavy for another Flutewise Pizza Party. I'm really grateful to all of the British families who came all the way to Croatia to experience this extraordinary course with me. I'm also grateful to the Croatian flute players and everyone else who made it possible - in no particular order thanks to Damira and Boris, Mark, Marko Zupan, Ana, Helena, Jadranka, Roko, Paola, Ivan, the people at Park Prirode Sutivan and all the lovely local people and anyone else I've forgotten! Thanks. Let's hope it can continue for many years to come. Photos from our course in Kastela, Croatia August 2018. 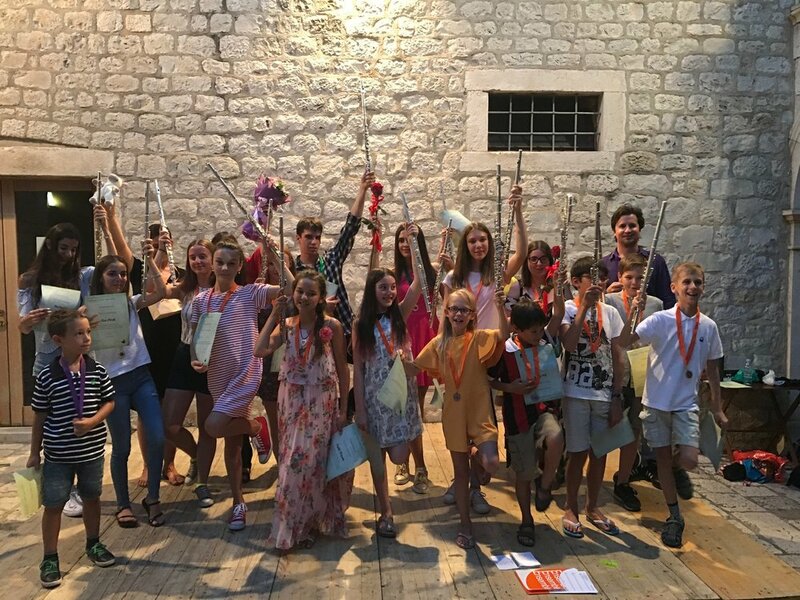 Not in any particular order but show our Flutewise Pizza Concert on the first night, working at the Ballet School, our trip and concert to Park Prirode Sutivan on Brac, concert and certificate/medal giving in Kastel Vitturi on the last evening.